I don’t know about you, but I’m always looking for new dinner recipes. My friend Julie, from This Gal Cooks, recently made some amazing Green Sauce Chicken Enchiladas. You’ve got to check it out if you haven’t already. In fact, she has a ton of delicious recipe ideas so I bet you end up pinning (or marking) a whole bunch of recipes. I had every intention of making Julie’s enchilada recipe, but I couldn’t find green sauce in my grocery store. I’m sure it was there and I simply missed it or was in the wrong aisle (I hate it when that happens). Perhaps it was a happy accident because I ended up creating my own enchilada recipe. 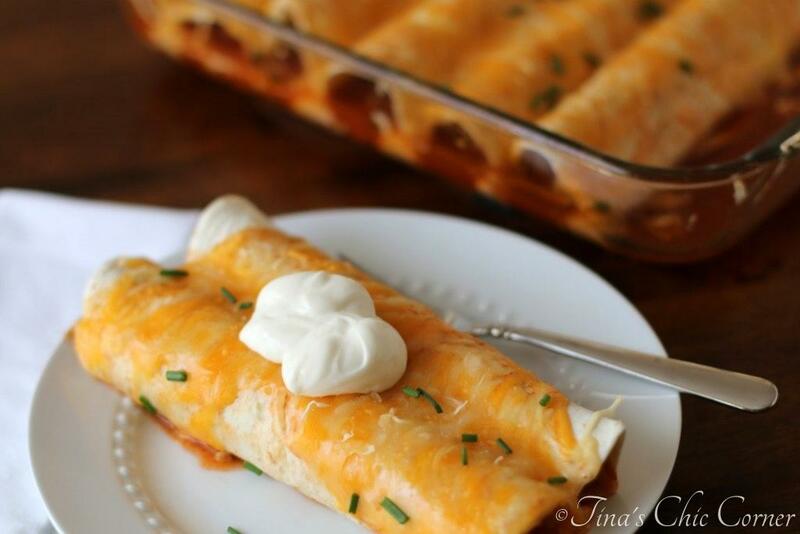 Folks, now you have two great enchilada recipes to try! The enchiladas in my recipe are stuffed with chicken and swimming in a red enchilada sauce buried in loads of cheese. In a medium skillet, heat the oil over Medium heat, and cook the chopped chicken. Season it with salt and pepper. Set it aside once it’s done cooking. 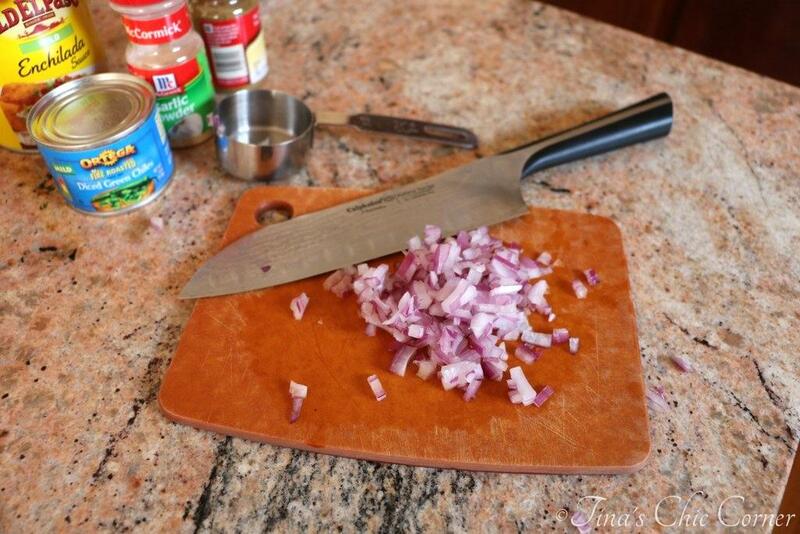 In the same medium skillet, cook the chopped red onion and minced garlic for a few minutes, until tender. Add in the whole can of diced green chilies (juice and all) and set aside the onion mixture. In a large bowl, add the cooked chicken, onion mixture, cumin powder, and garlic powder and stir all together. 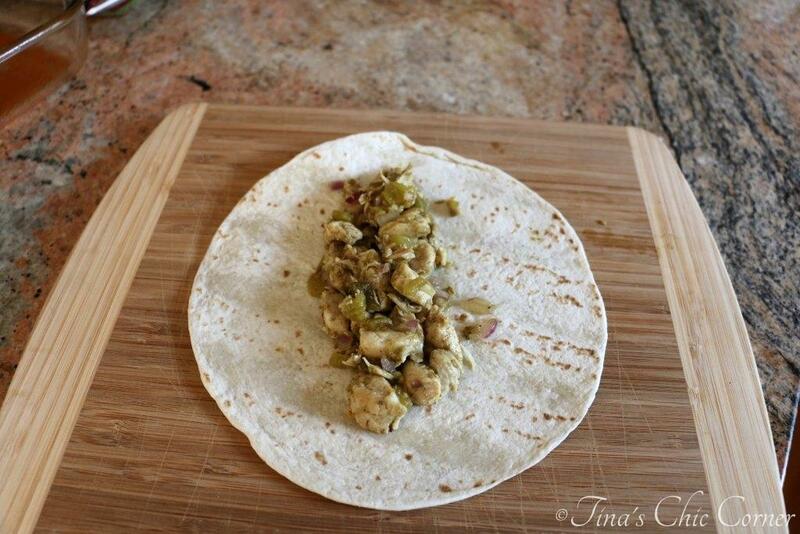 Lay some of the chicken mixture in a flour tortilla. Wrap it up and place it seam side down in the baking dish. Repeat this step until all enchiladas are done. Pour the rest of the enchilada sauce evenly over the enchiladas. Sprinkle the cheese over the top of them. Bake in the preheated oven for 15 to 20 minutes, until the cheese is melted. Red onions tend to be a bit sweeter and have a more mild flavor than other onions (plus you don’t cry as much when you cut them). I found it ideal for this recipe since there are plenty of other powerful flavors. If you’ve never used enchilada sauce or diced green chilies, you can see the brands I used in the background of the picture below. I know for me sometimes it helps to get an idea of what I’m looking for in the grocery store if I’ve never used the ingredient before. I love the taste of garlic and cumin powder and they enhance all of the other flavors in this dish into an authentic Mexican-splosion. Gosh it smells amazing! I wish someone would invent scratch and sniff computer screens. 😉 Hmm. There are some scary things out there that I don’t want to smell, so maybe not. Traditionally, corn tortillas are used in enchiladas, but I used flour tortillas because I think they taste better. Feel free to use any kind of tortilla you prefer, even whole wheat ones or those tortillas that are fun colors would work well with this recipe. Cheese, cheese, and more cheese! I used a Mexican blend of cheeses to help enhance the Mexican flare of this dish. If you can’t find this blend in one nifty bag at your grocery store and you don’t feel like buying four kinds of cheeses (I don’t blame you) then simply use all 8 ounces of any type of the cheese you like. Try to use a cheese that melts properly though. 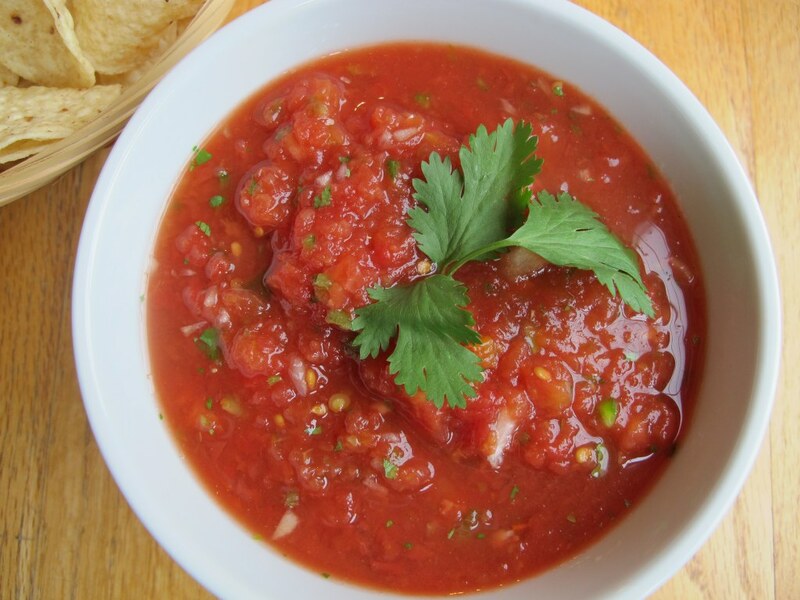 Red enchilada sauce is a thin tomato based sauce with a peppery chili flavor. 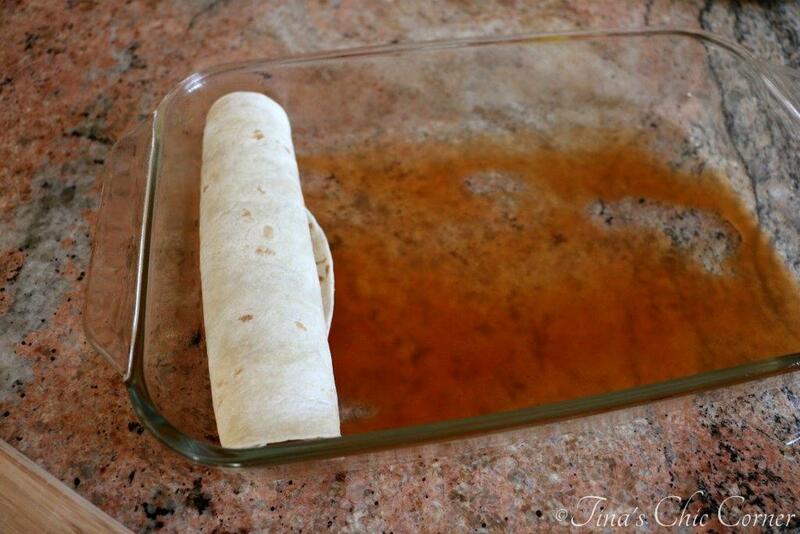 It helps keep the stuffed tortillas nice and moist. However, I don’t find that it has much flavor which is why I had to kick the filling up a notch in flavor town. Of course I had to top my plate with light sour cream and chives, perfect for most Mexican dishes, and decorative to boot. This dish is not spicy. Since my husband and I have different tolerance levels for heat, I wanted the heat to come in the form a topping so that we could each make our plate what our personal taste buds desired. Tabasco sauce is a great way to kick the heat up but you should definitely be careful. Conveniently it comes in several flavors and in various levels of heat. My husband’s personal favorite variety is Tabasco’s Chipotle Pepper Sauce flavor. It’s hot but not obscene and it packs tons of smokey flavor. I used a lean meat, low fat cheese, and low fat sour cream so this is definitely a healthier Mexican dish than what you’re likely to get at a restaurant. Now all I need to do is figure out how to make fried ice cream! 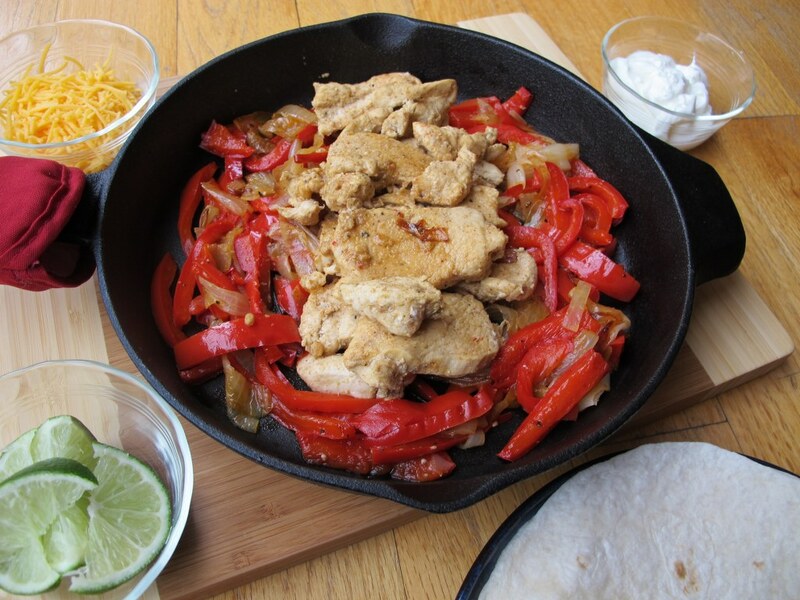 Here are some other tasty Mexican dishes. These look simple and scrumptious, Tina! Love enchiladas! Have you ever used corn tortillas for enchiladas? Would they roll and not crack? I want these for dinner, they look so scrumptious! And you bet I’m in for cheesy anything! These look fantastic Tina! My hubby has an obsession with enchiladas so we love making them at home with flour tortillas too 🙂 Yours sound amazing and look perfect 🙂 Great idea to add Tabasco sauce! I love that I have everything to make these for dinner this week! Cant wait, already know they will be a hit! 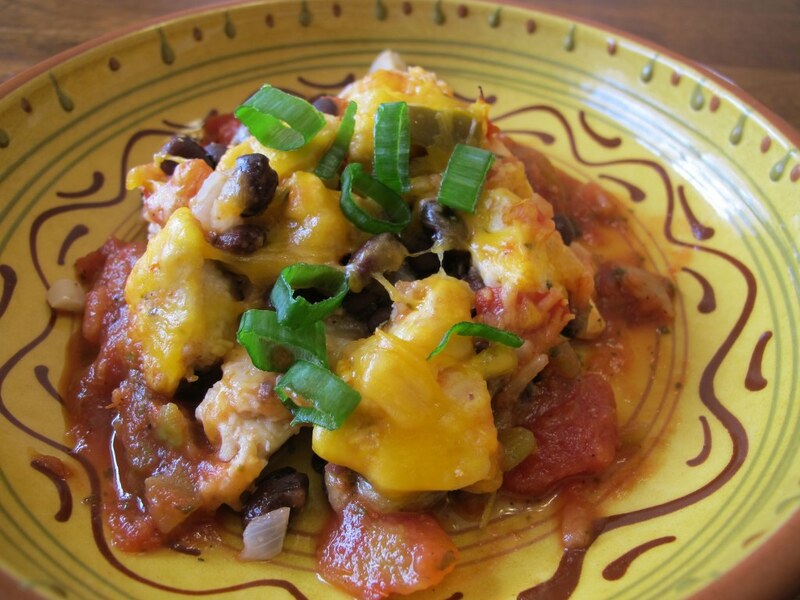 Here’s to coming up with another delicious enchilada recipe, because two is always better than one! I always need new recipes, too, Tina, so I’m pinning this! I love this so much! Enchiladas are probably my favorite things ever. I could eat them everyday and not get tired of them. Haven’t made them at home yet though, so I must try this! I am always looking for new dinner recipes, and am definitely adding this to my list! These look so good. I love Mexican food!! Hi Tina! My husband and I aren’t ones for Mexican food, but these look so delicious. I will try these, though, as soon as I have all the ingredients. Thanks for the recipe. 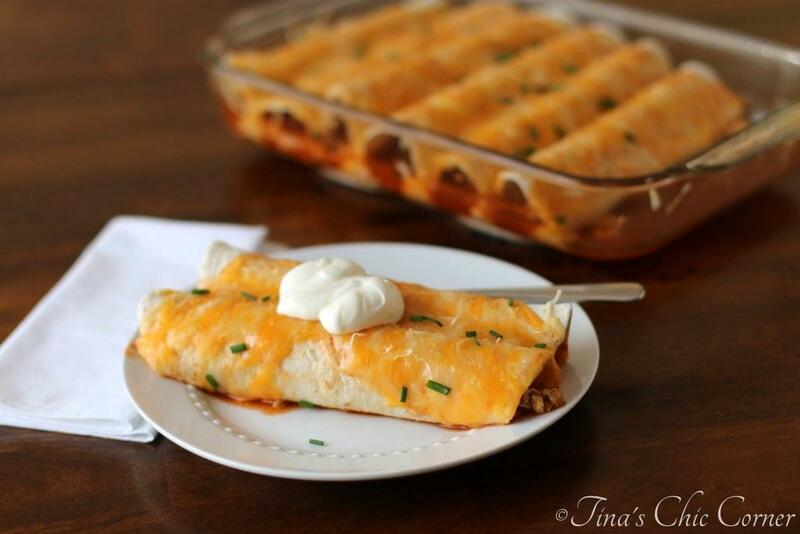 Yum, I love enchiladas and these look great, not too heavy and saucy. And I’m liking the touch of chives. Delicious! I think these enchiladas will definitely satisfy any Mexican food craving. 🙂 I hope you enjoy at as much as me and my hubby! I hate when I can’t find an ingredient at the store. I had that the other day with sweet chilli sauce. Couldn’t find it anywhere! And thanks for the comment on my blog because now I’ve found your blog! Adding you to my reader. Can’t wait to see what you make next. I have made enchiladas HUNDREDS of times, and they have NEVER looked as gorgeous as these do!!! These photos are simply amazing and make me want to reach into the screen and eat them! Gorgeous! I think I could eat the whole pan. Oh my goodness, you are sweet! Thank you so much. 🙂 I appreciate you stopping by. 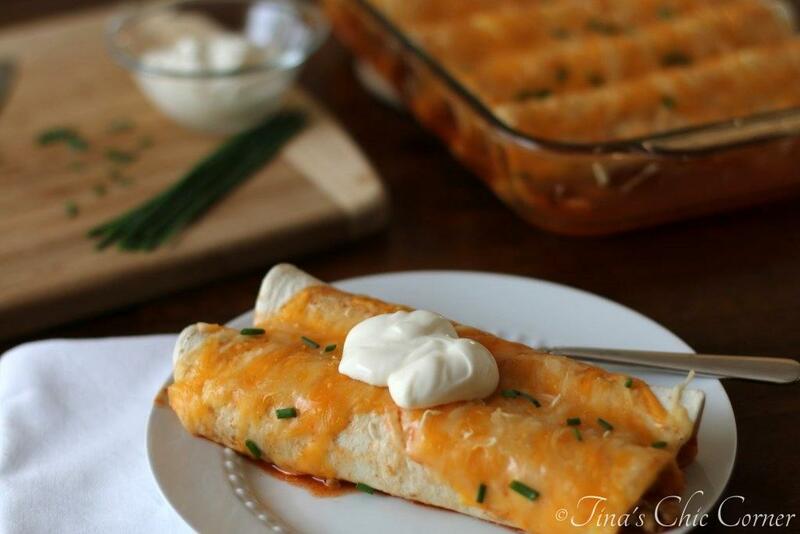 Those are some mighty good looking enchiladas! There’s nothing like good home cooking and the filling/proportions look perfect here. I love enchiladas!! These look delicious and will be happening over here soon. Awesome sauce! Let me know if you end up making them. You had me at “loads of cheese!” I am always on the lookout for good dinner recipes too…and now I have two to choose from! Oh gosh, I loveeee chicken enchiladas! haha I haven’t made them in far far too long. Yours look awesome – I love that you garnished them with chives too! Have a great weekend!! Thanks Ashley! I’m definitely always thinking about presentation points but chives really do taste awesome on enchiladas. 🙂 You too have a lovely weekend! These look great. I have been wanting to make enchiladas for over a week now. I should give this one at try! I love enchiladas!! These look amazing! Enchiladas are money dinner food! I love go-to dinner recipe ideas like these. Thanks Erin! I completely agree. 🙂 Have a lovely weekend! These looks great with all that melty cheese. 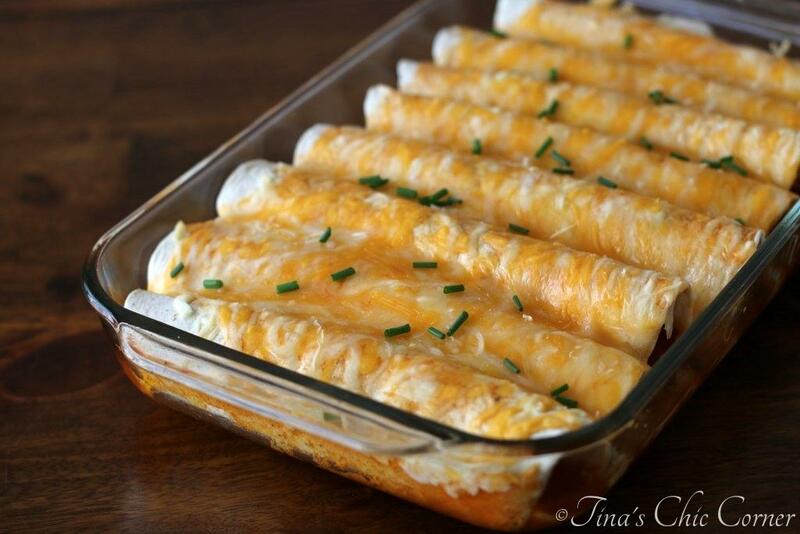 My dad loves enchiladas so I will have to make these for him!